The Mark 1 Spitfire sports car, with body styling by Michelotti. was launched in 1962 at the London Motor Show. 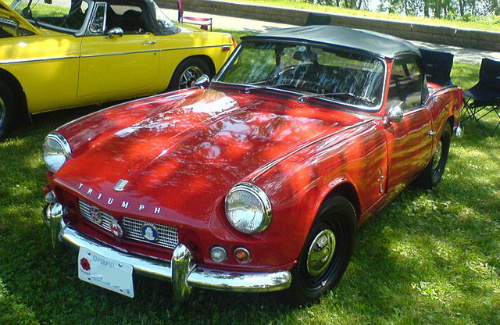 Using components based on the Triumph Herald saloon, this two seater convertible was powered by an 1147 cc, straight-4, OHV engine that developed 63 bhp at 5750 rpm, and 67 ft/lbs of torque at 3500 rpm. Fitted with a four speed manual gearbox, with optional overdrive on the top two gears from 1963, two SU carbs, and a 9:1 compression, it produced a top speed of 92 mph, with 0-60 mph in 15.5 secs, and a standing 1/4 mile in 20.9 secs. The steel body was bolted to a modified Herald chassis which gave it a curb weight of only 711 kg. It had front disc brakes and rear drums, and the swing axle independent rear suspension produced heavy over steer when the sports car was driven hard. It gave an overall fuel consumption of 31 mpg. By the time production ended in 1964, a total of 45,753 Mark 1's had been built.